Future Market Insights has announced the addition of the “Deblistering Machines Market: Increasing Use of Low Volume and Compact Deblistering Machines in Pharmacies Expected to Boost Sales: Global Industry Analysis 2013-2018 and Opportunity Assessment 2019-2027" report to their offering. FMI research found that 5 in 10 deblistering machines were sold to pharma manufacturers who heavily rely on efficient, flexible and speedy functioning of the blister packaging process. As the competition among pharmaceutical companies intensifies, manufacturers are attuning to advanced production processes to shorten the time to market of medicines. While deblistering machines significantly improve the efficiency of blister packaging, pharma companies will continue to register significant application of deblistering machines in the coming years. Medical waste recyclers are the second prominent end users of deblistering machines and accounted for 3 in 10 deblistering machine sales in 2018. 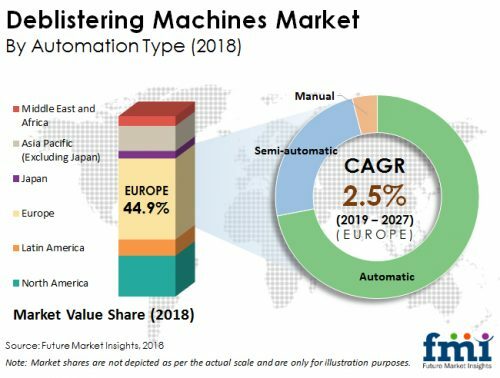 The FMI study finds that demand for automatic deblistering machines will continue to rise in the 2019 and beyond. Over 28 thousand deblistering machines are expected to be sold in 2019, with sales expected to grow at 2.3%. Automatic deblistering machines transform a manual and laborious deblistering task into an automated process. Superior operational output of automatic deblistering machines in terms of short-run recovery of delicate and high-value blister packs of different types including alu/alu packs, paper backed, child resistant and senior friendly are influencing adoption among end-users. According to the study, sales of semi-automatic deblistering machines are expected to increase at a considerably higher rate and account for over 29% of all the deblistering machines sales in 2019. Semi-automatic deblistering machines are highly used for tablets and capsules recovery from push-through blisters. Usually, these machines are smaller, portable and used for low-volume deblistering tasks. FMI study estimates that nearly 6 in 10 deblistering machines sold in 2018 were with 30-60 bpm output. According to the study, demand for deblistering machines with 30-60 bpm output is estimated to grow at 2.8% in 2019. The study also analyzes the demand for deblistering machines with ‘less than 30 bpm’ and ‘60 bpm and above’ output. Collectively, they are likely to account for 4 in 10 sales of deblistering machines in 2019. Regional analysis carried out by FMI reveals that Europe continued to lead demand for deblistering machines. According to FMI’s analysis, North America is the second leading consumer of deblistering machines whereas APEJ is estimated to register a rapid rise in demand. Collectively, both regions will account for two fifth of the global deblistering machine demand in 2019.